After traveling down to the Red Sea, Lehi and his family pushed forward for another three days before setting up their first long-term camp in a valley with “firm and steadfast, and immoveable” walls, and a river “continually running” into the Red Sea (1 Nephi 2:5–10). In poetic fashion, Lehi named this river after his oldest son, Laman, (1 Nephi 2:8–9; 16:12), and the valley after his second son, Lemuel (1 Nephi 2:10; 16:6). Rivers are rare in northwest Arabia. 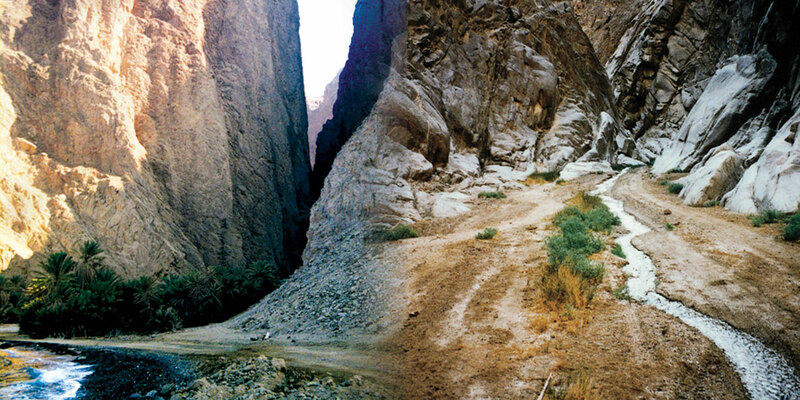 While many of the typically dry riverbeds briefly overflow with water during the rainy season, a comprehensive geological survey published in 1984 concluded that Saudi Arabia “may be the world’s largest country without any perennial rivers or streams.” This lack of year-round rivers led several researchers to propose that the “continually running” River Laman was one of the many seasonal rivers that run through the wadis—deep canyons and narrow valleys—of northwest Arabia. They had found Wadi Tayyib al-Ism, a narrow valley 74 miles south of Aqaba, along the Arabian coastline. Estimates for daily travel in the Arabian deserts in antiquity range between 15–25 miles per day. Wadi Tayyib al-Ism thus falls just within the maximum distance of a 3-day journey (45–75 miles) from the northern tip of the Gulf of Aqaba, a northeastern extension of the Red Sea. Fruits and grains are found growing naturally at Wadi Tayyib al-Ism (see 1 Nephi 8:1), and the wadi’s sheer granite walls rising about 2000 ft. are among the most impressive in the region, easily invoking Lehi’s description, “firm and steadfast, and immovable” (1 Nephi 2:10). Most significantly, there was a small stream running through the wadi, and return visits made at various times of the year confirmed that water flowed in the stream throughout the year. Potter and his colleagues had discovered the first—and to date, the only—known perennially flowing river or stream in all of northwest Arabia. Today, few would call the small stream a river, but it may have been more like a river in Lehi’s day. Some accounts from antiquity suggest that northwest Arabia was wetter anciently, and the stream has been severely reduced in recent years as its water has been reallocated to more populated areas. In any case, the Hebrew term nahar actually means “perpetual course of water” and was applied to both rivers and streams. It is impossible to be certain if Wadi Tayyib al-Ism is the Valley of Lemuel. Perhaps, since it was wetter in that region during ancient times, there were other perennial rivers and streams that have since dried up. But the existence of Wadi Tayyib al-Ism, with its “firm and steadfast” granite walls and “continually running” stream demonstrates with certainty that a river-valley like the one described in 1 Nephi 2 really exists, and that it is within the distance of a 3 day-journey from the northern tip of the Gulf of Aqaba. No wonder Lehi stopped, “built an altar of stones … and gave thanks unto the Lord” upon arrival (1 Nephi 2:7), and made exclamatory, poetic declarations exhorting his wayward sons to be firm, steadfast, and immovable like these impressive rock walls, and continuously running into the fountain of all righteousness like this clear-flowing stream (1 Nephi 2:9–10). After traveling through a “brutal wilderness,” where “hardly a blade of grass breaks up the monotony,” Lehi no doubt recognized the Lord’s hand in guiding his family to such a rare valley with a “continually running” river. Kent Brown, “The Hunt for the Valley of Lemuel,” Journal of Book of Mormon Studies 16, no. 1 (2007): 64–73. Book of Mormon Central, “Did Lehi Use the Poetry of the Ancient Bedouin? (1 Nephi 2:9–10),” KnoWhy 5 (January 6, 2016). Ministry of Agriculture and Waters, Kingdom of Saudi Arabia, with the cooperation of the Saudi Arabia United States Joint Commission on Economic Cooperation, the U.S. National Graphic Center and the U.S. Geological Service, Water Atlas of Saudi Arabia (Riyhad: Saudi Publishing, 1984), xv; cited in George D. Potter, “A New Candidate in Arabia for the Valley of Lemuel,” Journal of Book of Mormon Studies 8, no. 1 (1999): 56. See Hugh Nibley, Lehi in the Desert/The World of the Jaredites/There Were Jaredites, The Collected Works of Hugh Nibley: Volume 5 (Salt Lake City and Provo, UT: Deseret Book and FARMS, 1988), 79–80; Lynn M. Hilton and Hope A. Hilton, Discovering Lehi: New Evidence of Lehi and Nephi in Arabia (Springville, UT: Cedar Fort, 1996), 51–53; Jeffrey R. Chadwick, “The Wrong Place for Lehi’s Trail and the Valley of Lemuel,” FARMS Review 17, no. 2 (2005): 211. For a critique of this point of view, see S. Kent Brown, “The Hunt for the Valley of Lemuel,” Journal of Book of Mormon Studies 16, no. 1 (2007): 66–67. Potter, “A New Candidate,” 55–56. Potter, “A New Candidate,” 59–60. The 74 miles are measured by on the ground travel, not a straight line. S. Kent Brown, “New Light From Arabia on Lehi’s Trail,” in Echoes and Evidences for the Book of Mormon, ed. Donald W. Parry, Daniel C. Peterson, and John W. Welch (Provo, UT: FARMS, 2002), 60. John W. Welch and Robert D. Hunt, “Culturegram: Jerusalem 600 BC,” in Glimpses of Lehi’s Jerusalem, ed. John W. Welch, David Rolph Seely, and Jo Ann H. Seely (Provo, Utah: FARMS, 2004), 4, give a slightly narrower range of 17–23 miles per day. George Potter and Richard Wellington, Lehi in the Wilderness: 81 New, Documented Evidences That the Book of Mormon is a True History (Springville, UT: Cedar Fort, 2003), 33–36; Brown, “The Hunt for the Valley of Lemuel,” 73. Potter, “A New Candidate,” 61. See also David A. Edwards, “Was Lehi Here?” New Era, January 2008, 11. John A. Tvedtnes, “More on the River Laman,” Insights: A Window on the Ancient World 25, no. 3 (2005): 2–3. Potter, “A New Candidate,” 61. Ludwig Koehler and Walter Baumgartner, The Hebrew and Aramaic Lexicon of the Old Testament, 2 vols., trans. M.E.J. Richardson (Boston, MA: Brill, 2001), 1:676. See also Jeff Lindsay, “Joseph and the Amazing Technicolor Dream Map: Part 1 of 2,” Interpreter: A Journal of Mormon Scripture 19 (2016): 184. Potter, “A New Candidate,” 62. Chadwick, “The Wrong Place,” 212–213. James K. Hoffmeier, Israel in Egypt: The Evidence for the Authenticity of the Exodus Tradition (New York, NY: Oxford University Press, 1997), 208. Brown, “The Hunt for the Valley of Lemuel,” 71. See also Potter and Wellington, Lehi in the Wilderness, 39. Alternatively, Lindsay, “Joseph and the Amazing Technicolor Dream Map: Part 1,” 184–185, 207–210, argued that the way the river dips below the surface and feeds the Red Sea through subterranean channels is reflected in Nephi’s careful description that the river “emptied into the fountain of the Red Sea” (1 Nephi 2:9, emphasis added). See Chadwick, “The Wrong Place,” 209–215 for an argument against this possibility. Brown, “The Hunt for the Valley of Lemuel,” 64–73, responds to Chadwick’s objections and concludes, after assessment of other proposals as well, that Wadi Tayyib al-Ism is the best candidate. Tvedtnes, “More on the River Laman,” 2–3. Eugene England, “Through the Arabian Desert to a Bountiful Land: Could Joseph Smith Have Known the Way?” in Book of Mormon Authorship: New Light on Ancient Origins, ed. Noel B. Reynolds (Provo, UT: Religious Studies Center, Brigham Young University, 1982; reprint FARMS, 1996), 145; “Book of Mormon Geography: The river of Laman and the valley of Lemuel,” Evidences of the Book of Mormon, online at evidencesofmormon.org. See also Jeff Lindsay, “Joseph and the Amazing Technicolor Dream Map: Part 2 of 2,” Interpreter: A Journal of Mormon Scripture 19 (2016): 254–270, which reviews several maps from Joseph Smith’s day for the kind of information available. While primarily focused on if these maps help identify Nahom (they don’t), Lindsay also mentions the Valley of Lemuel on occasion, noting the absence of any indication of such a river valley on these maps. Daniel C. Peterson, “Not So Easily Dismissed: Some Facts for Which Counterexplanations of the Book of Mormon Will Need to Account,” FARMS Review 17, no. 2 (2005): xxv–xxvi. Potter and Wellington, Lehi in the Wilderness, 22, 41. I was in Saudi Arabia in 1978, and when we were being briefed about the country, we were told that there were no rivers in Saudi Arabia! This obviously did not 'jive' with what we had read in the Book of Mormon. Imagine when we found out that no less than a group of Mormons had discovered the ONLY river in all the land. We realized that anything that came out of the Ministry of Information should be taken with a pinch of salt. I did, subsequently, visit the area prior to my final departure visit the area, and there was indeed a place that was temperate in temperature, with lush fruit and vegetation in the north west of the country. Sad to relate, our journey at the time did not allow for a detailed exploration. My wife and I, along with my son and his family and 4 other families from Dammam, Saudi Arabia flew to Tabuk, Saudi Arabia in Dec 2015, we rented 5 SUV's and drove to this Wadi using GPS coordinates to get there. We camped overnight and hiked the 5 miles through the Wadi to the Gulf of Aqaba, and of course the river (stream) appeared from underground and flowed the entire way and disappeared back underground about 500 yards from the mouth of the canyon. The locals we met at the mouth of the Canyon told us that this was where Moses parted the Sea and led the Children of Israel to the Promised Land. We later found and visited where Mt.Sinai is located and the alter used to build the Golden Calf. We visited many of the sites described in the references you used in this article you wrote. Was an amazing experience and tho we all marveled at the many obvious landmarks described in the Book of Mormon, we did not need this verification for our testimonies, but it sure was cool to experience. Now it is even more meaningful to know what you relate in this article is somewhere I have been and can relate and testify of. Thank you.